This article will show how to import OHLC EvE market data in a free, commercial trading platform, MultiCharts®. 1) Go to the Multicharts® website and ~1~ version of the platform, not the real time one (it is not free). 2) Install the software, it’s a quite easy and straightforward process and the application won’t install odd drivers and similar quirky bits. Don’t start it yet. 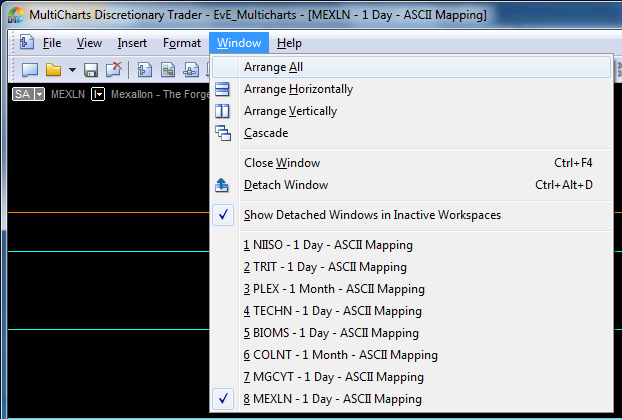 3) I have created a neat template (called Workspace by that software) that fits quite well with EvE markets. I have published it on this website for everyone to enjoy. Here’s the download link. Get it, unzip it and save it in your Documents folder. 4) If you don’t have any OHLC EvE market data, feel free to download and unzip this Mexallon – The Forge region test data. It won’t be updated (you will need to ask Vaerah) but it’s valid data to test the whole setup. Place it somewhere easy to find, possibly a dedicated folder. It will come handy in case you want to store price data dumps for many commodities. 5) Start the trading platform. 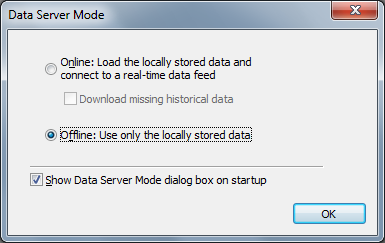 It will show an initial popup asking the Default Server Mode. We don’t need any data streaming and much less subscriptions, therefore check the options so that they look like the provided picture. 6) The software will show a number of empty charts. They are empty because we told it not to load anything. We don’t need those charts as well. In order to close them, we may press “F4” or go in the File => Close Workspace menu. An alternate way is to press the X icon all to the upper right of the graphs. Repeat this process until you don’t see any charts any more. It’s possible to add as many commodities as you want, I just included a sample of them. The next steps are only needed the first time we add a new commodity. Once it’s been added all you need is to start the software and switch to it and you are done. I enjoy what you guys tend to be up too. This type of clever work and exposure! Keep up the amazing works guys I’ve added you guys to blogroll.